THE Wattles Junior Rugby League Club has raised $3300 for Soldier On, a fund-raising effort to support ex servicemen and women who have faced tough times after serving in the past 20 years. The money was raised at home games against the Stanthorpe Gremlins at Platz Oval. The club received a lot of donated prizes from Warwick, Allora, Clifton and Toowoomba businesses for a multi-draw raffle which raised $950. There was one donation from a Brisbane business. Each of the boys from Wattles in the under-16 age group had to secure their own sponsor for a jersey with the profit going to Soldier On. The regular club colours were camouflaged to make a point of difference with the regular jerseys. The idea of supporting Soldier On was developed by Wattles committee members Leeanne Eastwell, Ian Brady and Grant Lollback. "There has been discussion about having a fund-raiser each year during a game against Stanthorpe," Lollback said. 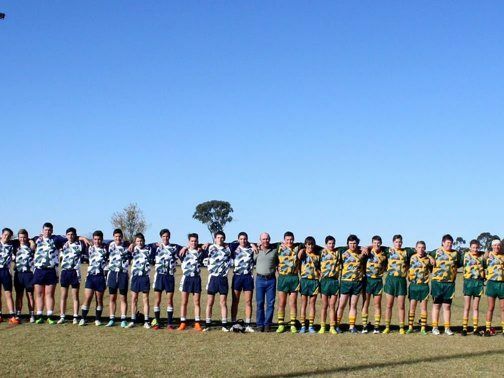 "The Stanthorpe under-16 team also wore special jerseys printed for the game and the club presented a cheque for $300 to Wattles to help with the fund-raising for Soldier On." Steve Stockley from the Army base at Oakey was at Platz Oval to present the jerseys to each player in the U16 grade. Wattles played Stanthorpe in seven games at Platz Oval with the home side 20-18 up in U16s. Nick Van Der Poel won the award for best U16 player from Wattles while Regan Sullivan was the top player from the Stanthorpe Gremlins.